Holding the flagship event of our social calendar at Drapers’ Hall in Throgmorton Avenue proved to be a highly successful innovation. Its reputation as one of the City’s finest livery halls is well-deserved and, in terms of the grandeur of the reception rooms, it ranks comfortably alongside the Mansion House. As we arrived, to be welcomed by Susan Wood our Master, the Honourable Artillery Company Brass Quintet was already disseminating a mood of relaxed conviviality. They continued to entertain us throughout dinner playing many of our favourite pieces. Dinner itself was delectable, starting with Arbroath smokie mousse with a citrus and saffron dressing, followed by tournedos of beef topped with a wild mushroom mousse, the former accompanied by a 2008 Muscadet, the latter by a 2005 St Emilion. Dessert was a very refreshing summer pudding. The excellent waiting staff added to the charm of the occasion. Before dinner there had been an opportunity to inspect this year’s prizewinning entries in the Feltmakers’ Hat Competition. 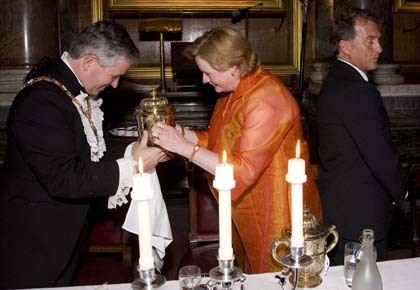 The winner of the Feltmakers Award 2010, presented by the Lady Mayoress during dinner, was Ms Awon Golding of Kensington and Chelsea College. Her design was startlingly original in its conception and assured in its execution. As ever, the winning entry was beautifully modelled by Jasmine. 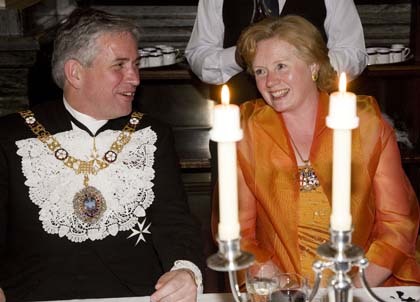 Our formal guests included the Lord Mayor Nick Anstee and his two sheriffs David Wootton and Peter Cook. 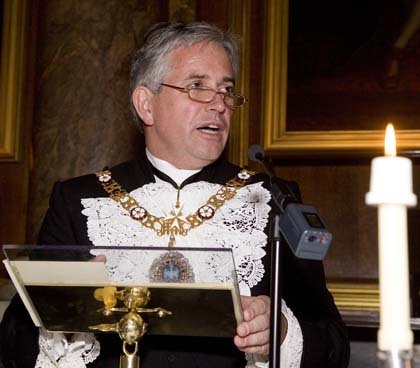 In his reply to Upper Warden John Ray’s witty introduction, the Lord Mayor, as well as expounding on the dynamics of the current political and economic scenario, congratulated the Feltmakers on the support given to the Army ‘Outreach’ Programme (an initiative of Assistant Simon Wilkinson). He also commented on the statistics provided by the Upper Warden on the difference in the times achieved by the Lord Mayor and his daughter in the London Marathon which, he maintained, were narrower than they might appear! In his modesty, however, he omitted to mention he is the first Lord Mayor to compete in the London Marathon whilst in office. He also confirmed that as a corporate turnaround specialist he was indeed looking forward to his forthcoming formal visit to the Hellenic Republic. In her response, the Master stressed the themes of charitable giving, education and fellowship. 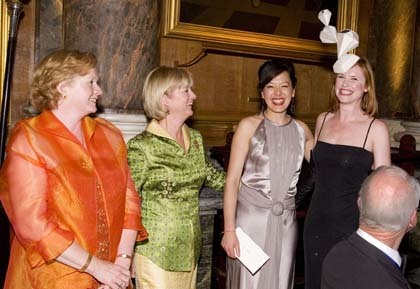 She presented a donation to The Lord Mayor’s Appeal 2010 (Pitch Perfect) followed up by some very amusing observations on the historical development of the various halls owned by the Drapers’ Company. She could not resist the temptation of moving on to compare Queen Elizabeth I’s favourable description of the Feltmakers with the less flattering characterisation of us by the Haberdashers’ Company in opposing our quest for independence all those years ago. 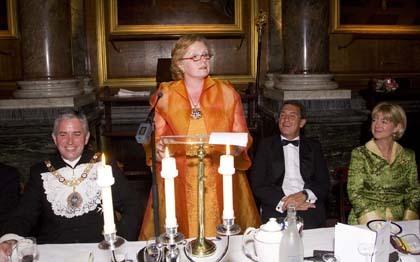 As a speech, it was brief, witty and to the point and thus served as a brilliant “warm-up” to her guest speaker. 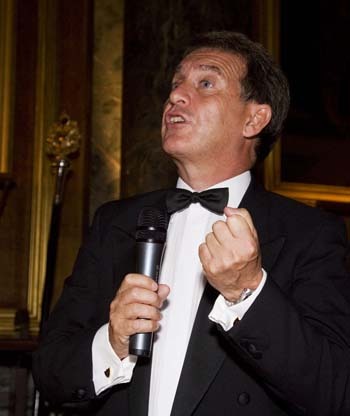 This was none other than Garry Richardson, the veteran BBC sports presenter, who proceeded to deliver a speech of enormous hilarity as he went back over his long career reminding us of the various “colemanballs” that he and other broadcasters had made over the years. But there was a serious point too: this was a man who, in 2001, during a rain break at the Wimbledon Tennis Championships, passed a note to officials requesting to interview Bill Clinton, the US President, at his seat in the Royal Box. Colleagues had said there was no chance of the President granting the request for the interview; Garry on the other hand thought: nothing ventured nothing gained and, as it turned out, luck was on his side! Ten minutes later, Garry was talking to the man himself in front of millions of viewers tuning in. At the end of the evening, our palates refreshed, there was another treat in store as we supped our stirrup cups to the beguiling and rhythmic delights of Becki Biggins and her Dream Team jazz band. 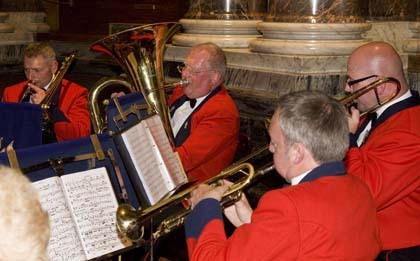 Together with the HAC Brass Quintet earlier on, we had during this wonderful evening been enchanted by music of a very high order which we could have listened to all night and which served to create a most memorable banquet for those fortunate enough to attend.